* * * PLEASE NOTE: SIM card will be activated with a local phone number before delivery, you will get an area code based on your zip code. Due to Simple Mobile's activation policy, this item CAN NOT be returned or cancelled once is shipped. We will ship a standard/micro SIM, If you need a NANO SIM card instead, please let us know. 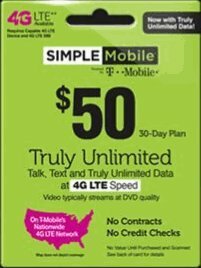 Simple Mobile works with any T-Mobile phone or any GSM Unlocked cell phone. You can always keep your account active after 30 days and keep your assigned phone number, just go to www.simplemobile.com and recharge. Also you may visit the web site to get a list of all international destinations included.